Publisher Terminal Software, Load 'n' Run, Edigamma S.r.l. 7.08 points at 24 votes (rank 332). 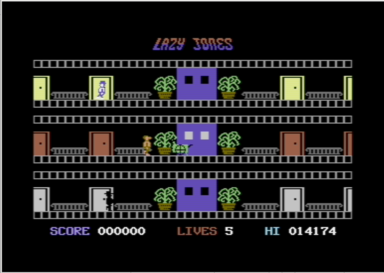 Lazy Jones holds the mirror up to the computer player, because you play to play computer games. The focus is on Shoot'em up's and skill games. The whole thing is accompanied by a basic tune which changes when you enter a room. So each room has its own tune, mostly you can recognize known music pieces from the early 1980's. 15 guest rooms, in 14 of them there is a game console. Each room can only be entered once. An exception are the rooms without games, so the guest room without console, the broom closet and the toilet. You can take flight there any time to avoid meeting the hotel manager in the uppermost floor, the cleaning cart in the middle or the ghost of the former hotel manager on the ground floor, because then you will lose a life. But you can also simply walk over these "enemies". Which room hides behind which door is decided at the start of the game randomly. If you have visited all rooms once, every room is available again, the game starts anew only everything is a bit more difficult. Here you have to levitate to the upper platform with 2 ballooons (only with the second balloon the character lifts off) and the balloons must not be shot. After kissing the girl you go back to the upper platform and grab a balloon. With this you float down again, etc. Just collect all eggs and do not get caught. Frogger. Get over the busy main street, kiss the girl, go back, kiss the girl and so on. Reminds of H.E.R.O. Rescue all people in the cave with the backpack helicopter. Skill is required, land on all platforms. Any number of mistakes is allowed. Shoot asteroids. Collision causes time decrease! You need juggling abilities here, the sticks need to be kept in the air. Any number of mistakes is allowed. Same as Tron, Lines, etc. The wall should get as long as possible, do not bump against obstacles. The pad needs to be shot up. Collision causes time decrease! As Break-Out or later Arkanoid. The wall needs to be broken through with the ball. It is not enough to hit the ball, press fire at the same time! It is not easy to get to ones drink at the bar, especially if you are constantly held back by this drunk. Well, this is what you get as a slacker from playing only computer games the whole day, as Lazy Jones does, you get nightmares. Even the laziest should sweep around a bit... but it seems as if Lazy Jones does the same here as he should do at the toilet.. Probably the only time in the game, when Lazy Jones does not have to feel guilty. All control commands are transmitted only once shortly and then conducted constantly. So you have to tip the joystick just briefly. That way, Lazy Jones is always on the move. 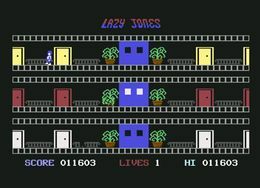 If Lazy Jones is in front of a door, you can enter the room or lift with the fire button. Very important: the joystick must not point into any direction during this, or else he will walk past the door. If you want to go up with the lift, you have to push the joystick up instantly after entering, because without any direction the lift will always go down. LEFT C= To the left Lazy Jones walks to the left until he gets another command. RIGHT SHIFT To the right Lazy Jones walks to the right until he gets another command. Forward Arrow up Up Lazy Jones jumps, whereby you can steer him with 'right' and 'left'. The overall score adds together from the reached score in the single games. The version by "Remember" contains next to 2 cheats (unlimited lives, collision query off in the hall) also the manual and some smaller bug fixes. Worf: "The idea for the game is great. The single games are rather modest but let you see which game were meant. Lazy Jones shines with diversity and is fun!". Guybrush: "That's right, the game idea and the sound are good, the realisation of the mini games rather not. However, 6 points from me." Borna: "The game has offered many mini games compactly, which were kept together by a frame plot (with each game the rooms were shared out anew) and very good music. A hit." 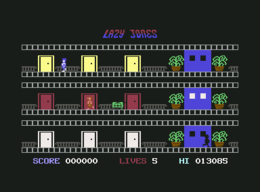 Robotron2084: "Games that you can play FOREVER, because they are simply as easy as a pie, they bore you quickly. Same here. 5 points (what a pity!)." Blubarju: "I only like the good music in this game. The mini games are simply such ones. For 5 or 10 minutes you might be well entertained here, but then the fizz has gone. Just barely 5 points." Blaster194: "In my youth the game was a revolution for me. A game in which you could play games. I am inclined to make a remake for years, as I have done with the Werner Flaschbier series. I have no idea if I will do it. But the work would pique my interest though." The tune of the subgame Stardust was covered by the German group "Zombie Nation"  in 1999. The title "Kernkraft 400" was a hit. In Greece and Denmark it went to first place, in Belgium, Great Britain and the Netherlands Kernkraft 400 reached the top ten of the charts, in Germany 21st place. In the SID file it is the Subtune 21. This page was last modified on 9 March 2019, at 00:11.